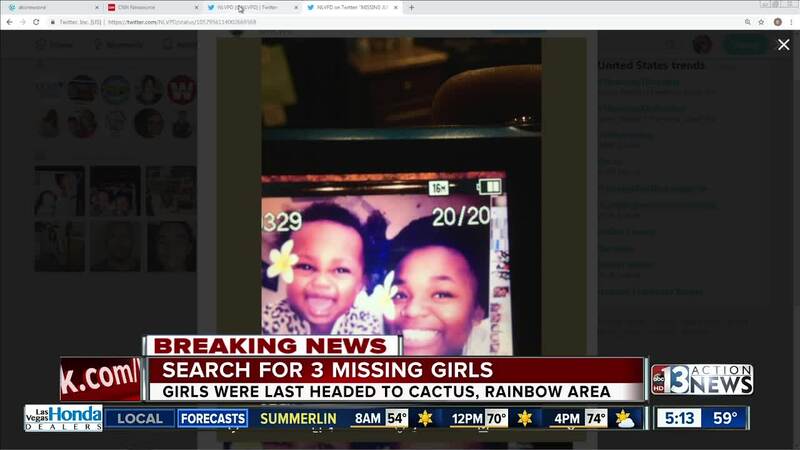 UPDATE AT 8 A.M. North Las Vegas police say they have found the 3 missing girls and they are safe. UPDATE***All three juveniles were located safe and sound at a residence in Las Vegas. We thank all our media partners for getting this out quickly and the community for their help. North Las Vegas police are looking for 3 girls -- ages 15, 10 and 10 months. They were last seen around 4 p.m. Wednesday near Lamb Boulevard and Craig Road. The 10-year-old girl has Down Syndrome and the baby is the child of the 15 year old. The baby was wearing a ladybug costume at the time of their disappearance. The three girls are in foster care. Police do not think they ran away but they are trying to locate them as soon as possible. They may have been headed to a family member's home near Cactus and Rainbow Boulevard. The 15-year-old is named J'Moni Moorhead. She is 5-feet 7-inches tall and 180 pounds with braided red hair. She was wearing a white shirt and jeans. 10-year-old Justice Hartt is 4-feet 9-inches tall and was wearing a blue, long-sleeve shirt and white pants. The 10-month-old baby is named J'Ariee Hartt. If you have seen the girls, please call police immediately.